It’s one thing to be aware of breast cancer. It’s another to do something about it. Here’s to the heroes. Who are making a difference. Who get out there and take action. Who prove every day that they are so much more than a color. Here’s to the people who are MORE THAN PINK®. 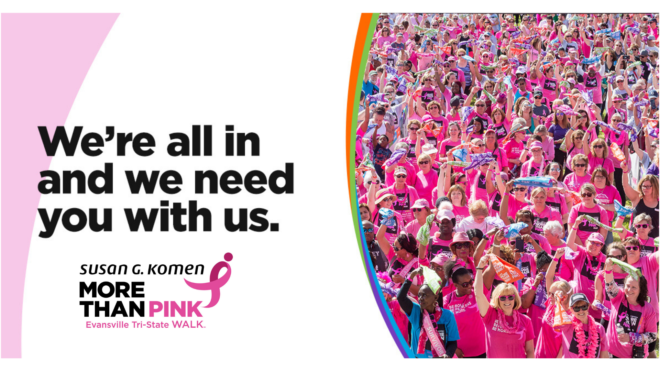 Join us for our inaugural Evansville Tri-State MORE THAN PINK Walk™ and share your determination to support the survivors and those living with metastatic breast cancer in our community and beyond. All funds raised support local education, screening, and diagnostic programs and global research efforts to find the cures. Together we will be Bold. Be Fearless. Be MORE THAN PINK®. Early bird registration fee is only $10 through July 14th! !